James Scheri is a backcountry enthusiast. Not only does he enjoy climbing rocks, James is also passionate about cycling, backpacking, fishing, and really anything that gets him out there! He is a USMC veteran who hails from the Midwest. 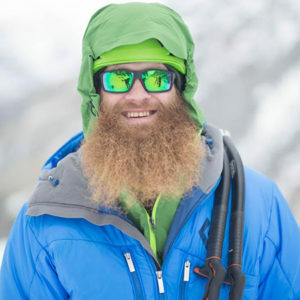 After graduating from Illinois State University with a degree in Engineering Technology, James made the move to Colorado to form a closer relationship with the mountains. In 2014, James was involved in a traumatic incident where he was hit by a train while riding his bike resulting in the amputation of his right foot. As a fairly new adaptive athlete, James quickly earned a spot at Nationals in Atlanta to climb on the 2016 U.S. Climbing Team in Paris. 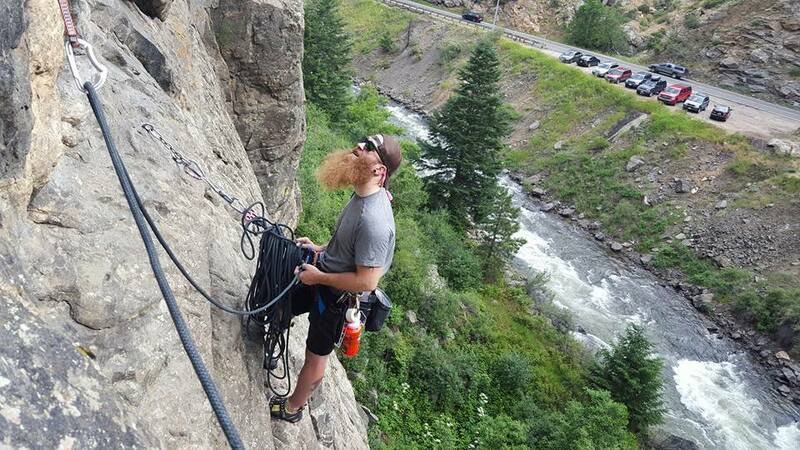 Now you can find James climbing all over the Front Range and enjoying the backcountry in Colorado. Paradox Sports: I gotta ask, how long have you had your bodacious beard? James Scheri: I have grown a longer than normal beard a couple times since I got out of the military, but I have been growing this one out since my accident. I had about a month of growth and after spending about three weeks in the hospital I decided to let it go. It seemed too complicated to try and clipper it there. I haven’t shaved since then – haha! And to be honest, I’ve gotten it caught in my belay device more times than I’d like to admit. I’ve had to trim about four inches off because of the mishaps with that. PS: So how did you first get linked up with Paradox Sports? JS: I started climbing as part of a rehab-type-deal through the Veterans Association that was connected to Adaptive Adventures in Lakewood, CO. 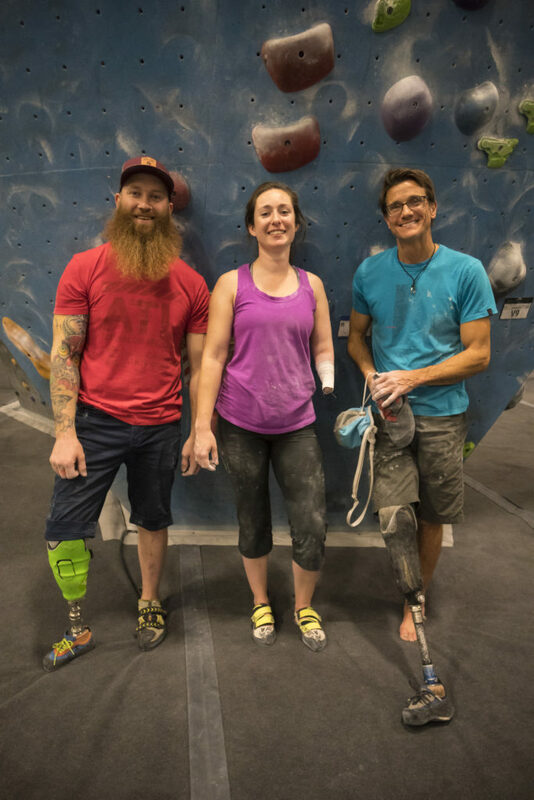 They co-partner and sponsor the Front Range Adaptive Climbing Club with Paradox. PS: With your accident happening just a few years ago, how has your transition to being an adaptive athlete been? JS: It’s been weird. 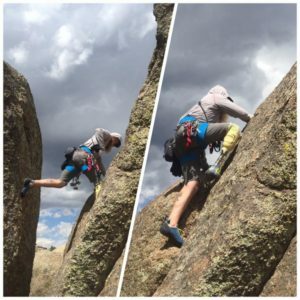 I started climbing before I could wear and walk comfortably with a prosthetic. My doctor said I should use it for therapy. The process has been pretty frustrating because before the accident I was an avid cyclist and served in the military. I don’t watch television and I don’t have any lazy hobbies. Other people seem to be more impressed with what I do than how I feel about it. I have always been an athlete so when I couldn’t perform how I was used to, I felt pretty weak. During all of the initial downtime I lost a lot of muscle. So when I started, I could only climb 5.6 routes. And even that was difficult. With the use of a prosthetic, climbing has been great but it was challenging to get back up to speed with snowboarding and mountain biking. But snowboarding has been going way better this year than past years. I am just super stoked on climbing now. PS: How long have you been climbing with the adaptive climbing club? JS: For about a year and a half now. It is good exposure to be around other adaptive athletes. It’s fun to help new inexperienced people get more psyched to climb. I think it is easier for people to be around other people in a similar situation. The club offers the opportunity for us to get together and share stories and our passion for climbing. I have made a ton of friends through Paradox, it’s an awesome community. I often climb with Mo Beck and Jeff Glasbrenner. Chad Jukes is super rad but I don’t get to see him too much. PS: What excites you the most about climbing? JS: It’s something I have always wanted to do. It has always seemed like an underground grass roots sport that looked super appealing. I would always hike and bike places but climbing takes you places most other activities can’t. It’s surreal. I love to climb multi-pitch routes. I love feeling super small and unimportant on a huge exposed wall. Being outside is what its all about. PS: Is there a certain kind of climbing route or style that you like the most? JS: I’m not too big on technical, crimpy, slabby routes. I tend to like more overhung, juggy, big move routes. And I actually like dynos quite a bit haha. Clear Creek Canyon has a bunch of stuff that I like to climb. PS: Do you have any favorite memories from experiences in the backcountry? JS: In 2015, I spent seven days out by Buchanan Pass alone. The first night, after hiding out from a big storm, I tried to beat the sunset but ended up having to camp pretty high up unknowingly. After about an hour of sleep, my tent started to get pounded with gusts of wind. My tent was flattened so I spent the whole night sitting up awake in my tent holding it up so it wouldn’t get damaged because I had six more days left in the trip! I still have no regrets from that night because the next day started out with one of the most amazing sunrises I have ever seen. And I could see it straight through my tent door! Throughout the seven days I only saw two other people and they were both thru-hikers. I am definitely going back to that same area. PS: What are you currently working towards in climbing? JS: I am going more towards training routines for competitions. I really just want to keep pushing myself to be a better climber. I have been working with a trainer to get stronger and be more confident using my prosthetic. I over compensate with my arms for the lack of foot. I am not currently working on any particular climb or project or anything like that but I have a long-term goal of trying to do something like the route Snake Dike on Half Dome and maybe even solo it after. PS: What trips have you enjoyed with Paradox? JS: Every year I make sure to be part of the Ouray ice climbing trip. It is such a great time. Also, I have really been into the Eldo and Shelf Road trips. Eventually, I want to make it on a [Yosemite] California trip. I did a few competitions last year so I didn’t get to make it out there. PS: What do you like about being an Ambassador for Paradox? JS: It’s cool to represent an organization that means quite a lot to me. It is not like being a brand ambassador for a pair of pants. It’s awesome to help spread the word a bit more. Paradox has helped me a lot with ice climbing. They helped me start out by having technical guides teach me stuff that that my friends and roommates couldn’t. The people and information and stoke that’s all shared is amazing. It has always been the people that have been associated with Paradox that I’ve looked up to. The Paradox community is full of good people, great trips, and experienced teachers. The majority of my climbing partners are able-bodied people that I have met at Earth Treks. Paradox offers a community of like-minded adaptive climbers and that feels really good to represent as an ambassador.